In 2018 Page Macrae Engineering was contracted to supply two new eco-hoppers and two mechanical chain grabs to the Port of Newcastle. Used for the unloading of a variety of products including phosphate, fertiliser and animal feed, the hopper and grab solution has provided an interim measure to replace an ageing gantry system and to meet the environmental compliance requirements. Despite their much smaller size, the eco-hopper/grab combination has a similar throughput per hour to the gantry-based system. The grabs having a larger capacity than the gantry-based grabs. The result has been a huge reduction in dust levels on their most difficult product because of minimised spillage from the grabs and a high level of dust suppressed by the hoppers. The eco-hopper and grab solution has proven itself in multiple ports throughout Australia since its introduction in 2010, meaning a much cleaner port environment and maximised productivity where they have been installed. 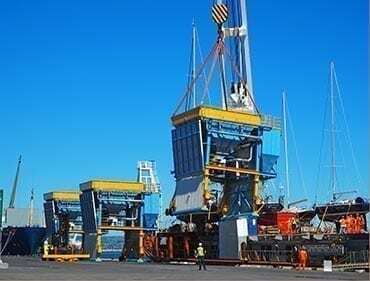 Three large dust control discharge hoppers destined for Port of Callao, Lima, Peru were shipped from Port of Tauranga. This was a first for the company with this export into the South American market. Approached by a former Australian client now working in Peru, Page Macrae Engineering was awarded the contract for the hoppers in September 2016 and construction of three 41 tonne units, was completed in March 2017. The company’s standard design hoppers were customised to suit the lower than normal wharf load capacity. The three hoppers were delivered to the Port of Tauranga in two sections and assembled as complete units on the wharf for transport on the deck of a specialist heavy-lift ship. A client representative arrived in New Zealand to inspect the hoppers before they left on their 3-week voyage to Peru. Two engineers from Page Macrae Engineering travelled to Lima to commission the hoppers and train the local operators. “We were very excited by the opportunity to export into this new market. The hoppers were unique due to their lower than normal overall height and their wheel set system, which allowed the client to tow them into place and have them up and running in a matter of minutes. Commissioning the project in Peru brought its own set of challenges, such as the language barrier, which we took in our stride once we got there. The Enviro-Max 70 Hopper, built for Sun Metals in Townsville, was unique in that it was specially designed to facilitate the unloading of zinc concentrate for transport to their plant while also being capable of loading ships with zinc ferrite for export. The project brought a number of challenges for the company: The hopper needed to eliminate dust emissions, the product itself was sensitive to compaction and did not flow well and an extremely tight delivery deadline was also required. Awarded the project in January 2016, Page Macrae Engineering engaged the services of a specialist consultant to carry out flow testing on the zinc product and report on handling difficulties. The result of the findings determined that a radical new approach to the design was required. The design called for a larger than normal hopper opening to achieve flow and to transfer the product to the truck a unique batch loading process was required. The end result, filling of a 90-tonne triple trailer road train in under 10 minutes. In order to meet local dust suppression regulations, the truck filling operation was enclosed and fitted with a dust extractor and self-cleaning filter system. This enabled the hopper to maintain negative air pressure inside the enclosure preventing dust from escaping as well as dust suppression at the grizzly. The 220-tonne unit was completed in October 2017 and shipped to Townsville for commissioning. The system was successfully tested and commissioned and is now fully operational. 2010 saw the introduction of a new era in discharge hopper and grab technology. Page Macrae Engineering was tasked with providing a solution for POAGS (now known as QUBE) Darwin operation. The client needed to comply with strict environmental standards being introduced around dust emissions. As the port shared the harbour and waterways with recreational users, they needed to ensure they did not damage the resource. We undertook a major research and development project to deliver on both the customers and environmental requirements. The result, a newly designed and built eco-hopper and grab solution designed to minimize dust emissions while maximizing productivity. The hoppers provided the vital link between removing bulk cargo from the ship’s hold and discharging into the waiting trucks as swiftly as possible. Special discharge spouts automatically adjusted according to the height of the load in the waiting truck, containing dust in the hopper rather than losing it to the atmosphere. Three newly designed diesel hydraulic bulk grabs were supplied as part of the package and incorporated the dust sealing and mobile remote-control technology. In 2010, Page Macrae Engineering delivered four, 14 cubic metre bulk discharge diesel-hydraulic grabs to the enormous Koniambo nickel project in New Caledonia. In 2010, Page Macrae Engineering delivered four, 14 cubic metre bulk discharge diesel-hydraulic grabs to the enormous Koniambo nickel project in New Caledonia. The project was a joint venture between the New Caledonian development agency and mineral company Xstrata Nickel. Xstrata will extract some 380 million tonnes of saprolite over the mine’s 50-year lifespan. The remote coastal peninsula location, preservation of wetland, waterway and marine environments, were requirements of the mining company. Efficient use of energy, protection of natural resources, waste minimisation and biodiversity conservation were mandates for the project. “The specifications for the project were very tight around our client’s expectations around noise and dust emissions from grab operation. We spent many hours designing and developing some new technology to incorporate into these grabs that is standard throughout the diesel-hydraulic range now,” said Port Equipment Manager, Bruce Ennis. The Koniambo project also required equipment that did not compromise on productivity. The compact profile of the grabs and low drift profile suited the deep channel loading facility. Downtime and maintenance minimisation were critical parameters. The grabs were fitted with diagnostic systems to ensure diagnosis was kept simple enabling faults to be fixed quickly. Building the power plant into the own sliding subframe module ensured the engine could be easily removed for servicing and testing. It also enabled a lower centre of gravity through the grab. The Koniambo project marked a significant shift in grab design thinking and resulted in a major research and development project into productivity and environmental sensitivity. When Bill O’Loughlin took over as Managing Director for Auckland distribution company A.G.Walter and Sons he was scratching his head over the company’s last purchase before his appointment. The steel and container delivery business had just purchased a Skate Table® cargo unloading deck. It was not a high profile piece of cargo handling machinery, but one that today holds Walters in a good position as an efficient handler of containerised steel. “I must admit, I came from a corporate background and of course questioned the outlay on such a piece of equipment, however, it has certainly proved itself in the last three years,”says Managing Director Bill O’Loughlin. The company had recently formed a strategic alliance with Australian steel corporate Smorgon Steel. Across the Tasman in Brisbane, that company had installed a similar piece of equipment and also operates a Skate Table out of Melbourne. Putting a Skate Table® in the Mount Wellington depot was not only valuable to cement the alliance by standardising handling capacity, it delivered significant productivity gains in the difficult business of steel shipping and handling. The product of Tauranga engineering firm Page Macrae Engineering, the Skate Table® enables easier unloading of containers with awkward loads inside them. By its nature steel is a particularly difficult, irregularly shaped cargo that can prove difficult to unload using fork hoists. The Skate Table® features chain driven rails drawn along a self-adjusting platform that aligns itself with the container floor through a laser levelling system. The rails creep under the containerised load, raise it via a sophisticated airbag system, and reverse the load out smoothly. A stand-alone control board provides menu-driven step by step procedure, with full faults analysis and warning facilities. Fork hoists are eliminated, one operator can use the system, and extraction time is reduced to only several minutes. A.G Walters had traditionally taken delivery of steel on flat rack containers and unloaded them with fork hoists. Typical load weights were 24t, compared to the 26t that can be fitted into sealed 40-foot containers and unloaded with the Skate Table. Break-bulk steel is forming an increasing part of the Skate Table’s handling of the company’s total annual steel shipments. A & G Walter’s, Rick Linton says flat racks are not popular with shipping companies because they don’t have enough of them, and can’t be stacked. He says A.G. Walters has always had problems with damage and rust when using flat racks trans-Tasman. Racks falling on top of each other, shredded covers and damaged steel were not uncommon, with whole racks occasionally being written off from damage in shipping. Having the product loaded by a Skate Table type system in Brisbane preserves its integrity right through to delivery. It is also more popular with shippers because containers can be stacked, and is safer to unload with a Skate Table® on arrival. “Typically with a flat rack you will have a lot of fastening and bands to remove, taking up to 20 minutes per rack, and involving two fork hoists”, says Rick. The Skate Table has helped reinforce A.G. Walter’s reputation as a quality handler of steel, setting a niche for itself in the competitive cartage business. This includes a partnership with Steel & Tube that extends over 70 years. Investment in equipment like the Skate Table®, coupled with long serving staff means the company has cemented its service orientated, rapid delivery culture, whether within Auckland or into the Bay of Plenty. Bill O’Loughlin credits a sophisticated design coupled to high-quality build from Page Macrae Engineering for creating a handling solution his business can use to grow with. “We have done a bit of containerising for export back to Australia, and I can see the potential for containerising aluminium and timber particularly for export. Frankly, though there is more than enough business on here, we have enough work for it just dispatching our steel deliveries.” With business growing, Bill O’Loughlin is confident the Skate Table could handle greater rotations, with the only restriction at present being storage and handling space at the company’s Mount Wellington base.